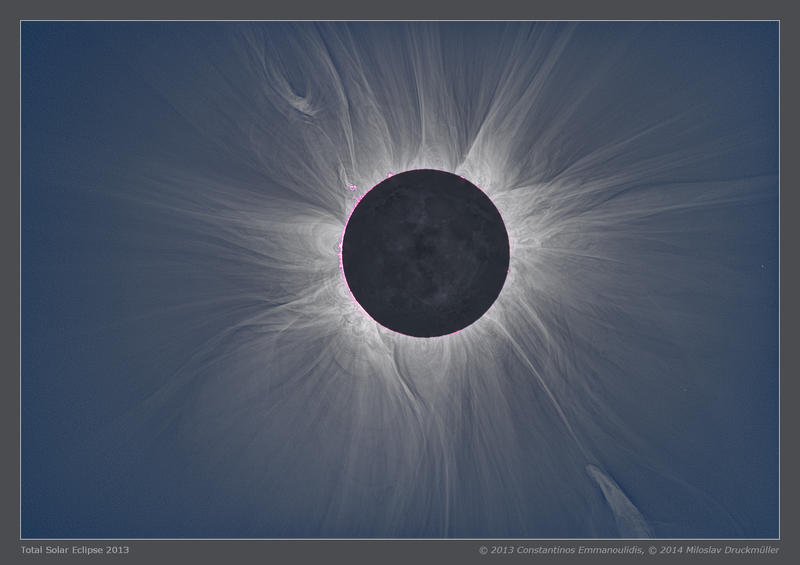 This image is, up to now, definitely the best maximum type solar corona image in MMV-project archive with respect to resolution and overall image quality. The fantastic sharpness of the image you may rate on the full resolution image. Faint stars are of one pixel size and some of them are nearly of 11 mag. The sharpness is the result of excellent optics, perfect focusing, nearly no vibrations during the exposure, perfect sub-pixel image alignment and excellent Nikon D7100 camera. Nikon DSLR cameras have much weaker low-pass filter than Canon DSLR cameras and therefore they give significantly sharper images. Processing Composition of 66 eclipse images. Eclipse images were calibrated by means of large number of dark frames and flat-fields, aligned by means of phase correlation, composed by means of LDIC 5.0 software, processed using Corona 4.1 in order to visualize coronal structures. Final processing was done using ACC 6.1 software. Note The graph above the table shows the average values of the relative number of sunspots in which the red line indicates the time of 2013 eclipse. Data from the World Data Center for the sunspot index, (Solar Influences Data Analysis Center, the Royal Observatory of Belgium) were used.